Does man ever look sillier than when trying to impersonate a fish? 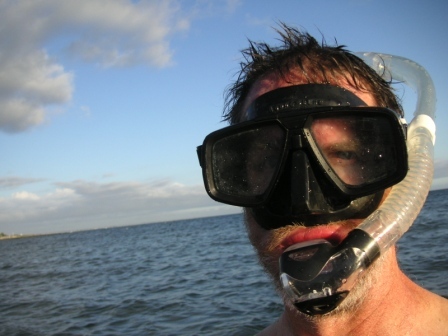 Snorkelling’s a bit like surfing or fishing or hang-gliding or skiing (not that I follow any of those pursuits): the conditions have to be right. You need calm, clear water, for starters. 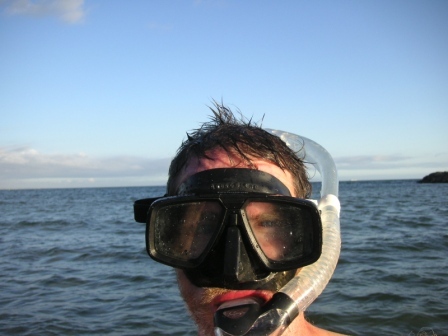 ‘Had four short snorkel-swims this week: two on Thursday, and again on Friday. Water’s still pretty cold so this is a matter of getting one’s bearings again. Bit by bit I’ll swim a little bit longer, a little bit further, a little bit deeper. When the conditions are right. Just right. Self portrait, with sloping water. From grey to green to blue. Even brown. From stillness to ripples to waves. Grey in the morning. Blue in the afternoon. Black in the evening. 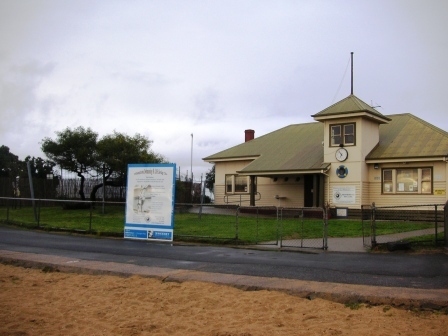 The very popular ABC drama Sea Change was partly filmed here at Williamstown beach. The exterior of the life-saving club was the exterior of the Pearl Bay courthouse (where Sigrid Thornton presided as magistrate). The Williamstown Swimming and Life-Saving Club celebrates its 90th year in October. The clubrooms above are a little younger, built in 1934. The cold northerly wind was howling on Wednesday, as it has been all week. My 19 year old son was flying to London on Wednesday night. He wanted one last glimpse of the beach before spending six months in Europe. 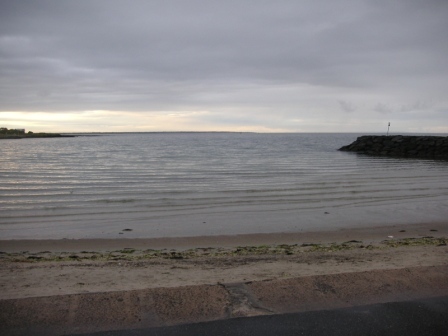 I’d already been for my dawn dip but at midday we hopped on our bikes and rode with the gale to Williamstown beach. The sand was flying, the water was choppy, heading offshore in a hurry. My son waded to waist deep. I took the plunge, for the second time in a few hours. That night my son flew away. When he comes back the summer winds and the summer water will be warm.